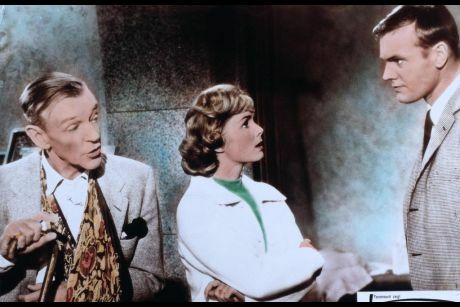 THE PLEASURE OF HIS COMPANY, coasting into 23rd place in 1961 by grossing$9,000,000, is another of the many comedies of manners & morals that show their age through the scripting, and are best enjoyed as nostalgia. 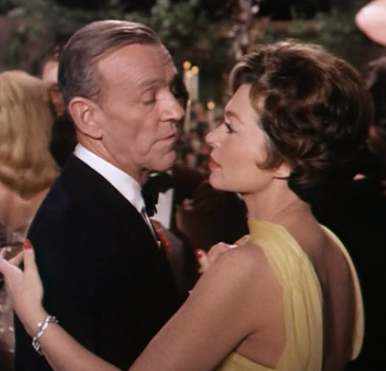 Fred Astaire plays a wandering, work-shy sophisto-cat who shows up at the home of his ex-wife (Lilli Palmer) to attend, and meddle in, the marriage of their daughter (Debbie Reynolds). Fred hasn’t seen Deb for years, and she’s about to marry a yahoo (Tab Hunter) whose insight into The Good Life is limited to things that pertain to his breed bulls–he’s a cattleman. Rather lengthy (115 minutes), it’s expensively decked out; the costume design and set decor are plush. 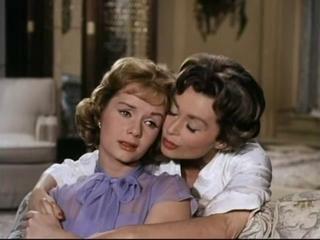 The four stars are deft, and there are good moments from Gary Merrill as Palmer’s current husband, and Charlie Ruggles as Palmer’s dad. But all the expense and expertise seems to add up to a whole lot of nothing more than trivia, directed by George Seaton.